Is Australia Sailing Away from a US Anti-China Alliance? Why did Prime Minister Turnbull and the LNP decide to go with the French option for our new submarines? One obvious reason would be to help their chances of reelection in June/July this year. But another question does not get as much attention: Does this choice signal a subtle but important shift in Australia's foreign policy? Our most important economic partner is China. However our most important military and political partner is the US, and the US is committed to a very aggressive anti-China military policy. This means our two best friends are really at each others throats. While this situation is never discussed publicly, surely the bureaucrats and politicians in Canberra are well aware of it. IS AUSTRALIA MOVING AWAY FROM US MILITARY STRATEGY IN ASIA? If we look beneath the polite diplomatic language, this is what happened: The US announced without Australian approval that B-1 bombers would be based in Australia, and Tony Abbott quickly said: “No!” Angus Grigg interpreted this as the first official indication from Canberra that Australia is not prepared to fully cooperate with the US in its aggressive anti-China policy. I think that the recent decision not to buy Japanese submarines should be seen in the same light. I could be as wrong as anyone about the LNP thinking behind this decision, however we cannot ignore the very special relation between Australia and China. In addition to its economic importance, Australia's is in China's patch, and nothing is going to change this simple fact of geography. Publicly the US has remained neutral about the choice of submarines, since they don't want to be seen publicly telling Australia what to do on such an important matter. However insiders and almost everyone else knew the plan to buy submarines from Japan was dictated by the US. 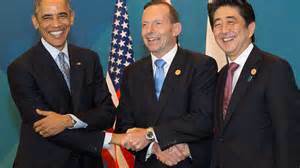 The deal was put together by Tony Abbott and Prime Minister Abe in 2014 as part of a US strategy to create a unified fleet of submarines from the US, Japan and Australia. They would all have had the same hi-tech information and weapons systems under US control. This fleet was to be a central part of the "contain China" plan formulated years ago in the US "pivot" to Asia. In the Australian Cameron Stewart wrote that "Japan had argued that settling its Soryu-class submarines to Australia would strengthen links between Australia, Japan and the US in the face of a rising China. "(4) But who is the tail and who is the dog? This is not just a Japanese position after all. The US would have formulated the policy, and Japan was asked to sell it to Australia. Some US supporters in Australia might see the decision not to go along with the current US military plans resulting from “bullying” by China. But who is the real bully in the world today? The US itself. Australians who blindly follow the US anti-China policy ignore our long-term future in Asia. History and common sense tells us that the US Empire will not last forever. Of course the Chinese realize this. We should not repeat the disastrous thinking in Canberra before WW II. At the time nobody realized the British Empire was fatally weakened by WW I. Few could imagine the military power of the Empire in Asia would disappear almost overnight. It would be foolish and akin to treason for Australian leaders to fail to recognize that in the future the importance of the US in Asia will decline to zero. In such a future Australia will not have a powerful Western friend to "protect" us. We will either become a net-colony of another country in our region, like China, or we will need to chart a more independent course relying on friendships with our nearest neighbors Indonesia and Malaysia. The US has pushed us into a somewhat hostile and arrogant approach to these countries, but we will need to change this if we are to move forward as an Asian country in Asia. We are different from the other countries in Asia, as they are different from each other. However we must realize that we or our ancestors came to Asia. This is where we live now. Like the descendants of African slaves in North and South America, or the Chinese in California, the migrants to Australia from Europe and other regions a cannot perfectly recreate their past homeland in their new world. The Australian government should not make important decisions about our future based on misguided loyalties to distant lands who, in the end, will only look after themselves. This realization gives the phrase “Australia - Love it or Leave it!” a different meaning. If you don’t see your future in Asia, you better start packing your bags. 4. The Australian, 28.04.2016, p. 2.